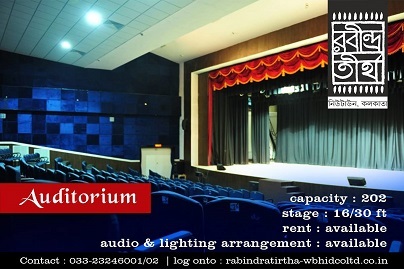 All cultural functions at Rabindra Tirtha will take place in the auditorium. This auditorium can be rented. Interested parties can contact the office of Rabindra Tirtha. i) Refundable security deposit of Rs. 5000.00.
iii) Rs. 2000.00 for each additional hour subject to a maximum of 2 hours. iv) Rent for using auditorium over 3 hours : Extra Rs.3,000/- per additional hour if the party used their own sound, light and LED display screen. vii) On cancellation of the booking, full refund will be made if cancelled at least 10 days before the date of programme, 75% refund will be made if cancelled at least 5 days before the date of programme, 50% refund will be made if cancelled at least 48 hours before the date of programme, no refund will be made if cancelled after 48 hours before commencement of programme. viii) In case of rescheduling of the programme, Rs. 1000.00 will be charged as processing fee subject to availability of the auditorium on the chosen date. Audio arrangement: The Audio system of the auditorium is equipped with the most highly acclaimed audio products. This delivers uniform sound coverage throughout the hall with proper tonal balance. The audio system can be used for application like sound reinforcement during speech based application & live performance or recorded music. Lighting arrangement: The stage-lighting system has been designed in such a way so that it can cover all types of lighting and shading for drama, dance drama along with all other events that can be staged in this auditorium. The stage-lighting system has a combination of several no. of PAR-64, Plano convex spot & AAF Light fittings. The master control is a 36 channel fader console and a user friendly 72 way patch panel. 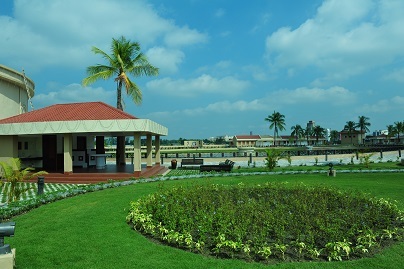 Rabindra Tirtha has two permanent exhibition halls dedicated to photographic exhibition on Tagore viz. Jibonsmriti and Chhabi o Gaan. The former contains photographs of Tagore capturing different moments of his life and a year-wise chronological biography of Tagore and the latter contains selected paintings of Tagore with a fascinating history of songs of Tagore (Rabindra Sangeet) recorded by several artists during the life time of the the poet. 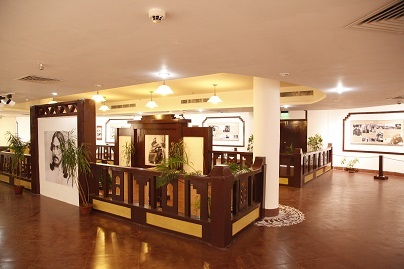 There is a hall of size 1290 sq.ft. which is also given on rent to interested parties for holding exhibitions of paintings/photographs/etc. Interested parties can contact the office of the Rabindra Tirtha. On cancellation of the booking, full refund will be made if cancelled at least 10 days before the date of programme,75% refund will be made if cancelled at least 5 days before the date of programme, 50% refund will be made if cancelled at least 48 hours before the date of programme, no refund will be made if cancelled after 48 hours before commencement of programme. In case of rescheduling of the programme, Rs. 1000.00 will be charged as processing fee subject to availability of the hall on the chosen date. The ultimate decision regarding the subject matter of exhibition at Art Galleries will be under sole discretion of Rabindra Tirtha. 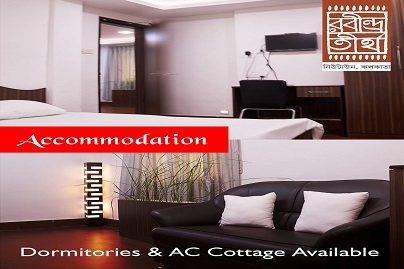 Rabindra Tirtha has got following types of accommodation facilities for interested researchers. (b) Separate dormitories for accommodating 30 men & 30 women. Rabindra Tirtha has a small cinema hall with capacity for 48 persons where interested visitors can enjoy movies based on stories by Tagore or documentaries on Tagore also. 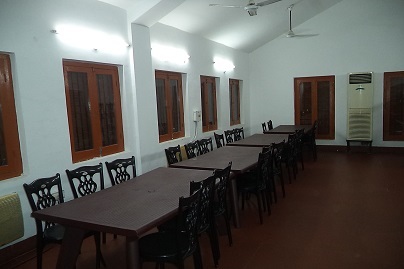 Rabindra Tirtha has a small music room with capacity for 20 persons. An appropriate library has already been opened for the members inside the Rabindratirha Complex. This Library has books on and by Rabindranath Tagore published by Publication Department of Viswa Bharati and other publishers in its possession apart from having books on Rabindranath written by writers of both West Bengal and Bangladesh. This Library has more than one thousand books. This Library remains open only for the members from 2.00 P.M. to 6.00 P.M. daily from Tuesday to Saturday of every week. Incidentally, the books of the Library are essentially meant for reading inside the library and cannot be taken away outside for reading, nor can the books be used for other purpose. A membership subscription of Rs. 500/- (Rupees five hundred) only is to be paid in advance towards obtaining annual membership. a) At the time of entry into the Library, bags etc. need to be kept outside. b) It is desirable not to take more than two books on the table for reading. c) Kindly cooperate with the concerned official at the time of taking and returning the books taken for reading. d) No person accompanying the member can enter the Library without permission from the Competent Authority. f) Members are requested to record time and date on the appropriate register at the time of entering and leaving the Library. All the members are requested to use this Library of Rabindra-study and co-operate with the Rabindra Tirtha Authority by using the Library effectively as per their requirement. All are requested to obtain the membership of the Rabindra Tirtha Library immediately and also encourage friends and neighbours to obtain the membership. Rabindra Tirtha earnestly solicit the co-operation of the residents of New Town on Rabindra-Study and any kind of valuable advice in this regard. Visitors can enjoy here snacks, tea etc. Rabindra Tirtha has various souvenirs related to Tagore. Interested visitors can buy souvenirs from our office. iii) Open space : Rs.500/- per hour subject to charge minimum 3 hours.